CUPERTINO, Calif. — Apple’s ring-shaped, gleaming “Spaceship Headquarters” will include a world class auditorium and an orchard for engineers to wander. Google’s new Bay View campus will feature walkways angled to force accidental encounters. 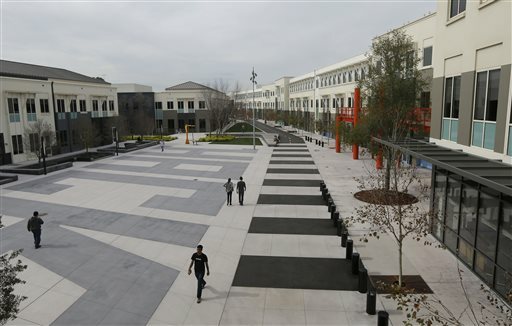 Facebook, while putting final touches on a Disney-inspired campus including a Main Street with a BBQ shack, sushi house and bike shop, is already planning an even larger, more exciting new campus. New Silicon Valley headquarters or expansions are under way at most of the area’s major firms, including eBay, Intel, LinkedIn, Microsoft, Netflix, Nvidia and Oracle. Many will be huge: Apple Corp.’s 176-acre campus will be one of the world’s largest workplaces. On the outside, many of the new buildings boast striking architectural designs and will collectively be among the most environmentally friendly in the country. Inside, there are walls you can draw on, ping pong tables, Lego stations, gaming arcades and free haircuts. Wheeler said he thinks Yahoo called everyone back to work “because they had gotten into a culture of laziness,” and that the firm will likely loosen the restrictions soon. Yahoo was, in fact, an early model of Silicon Valley’s happy workplace culture, touting their espresso bar and inspirational speakers as a method of inspiring passion and originality. Today yoga, cardio-kickboxing and golf classes at the office, as well as discounts to ski resorts and theme parks, help it receive top ratings as one of America’s happiest workplaces. Facebook staffers are welcome to stop by and play in Ben Barry’s Analog Research Laboratory, a large, sunlit studio with laser cutters, woodworking tools, a letter press machine and silk screening supplies. 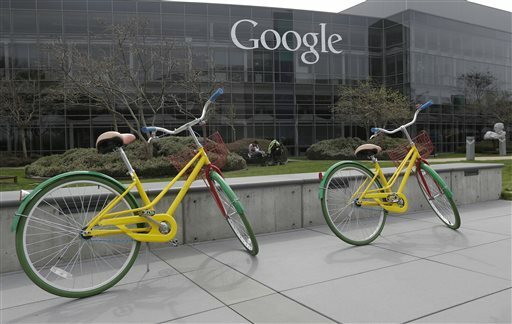 About six miles north at Google’s headquarters, workers on one of more than 1,000 Google-designed bikes rolled from one building to another. Others stepped into electric cars, available for free check outs if someone has an errand. In one office, two young engineers enjoyed a beer and shot pool. Google doesn’t want its Googlers to have to worry about distractions in their life. Concerned about the kids? Childcare is on campus. Need to shop and cook? Have the family dine at Google. Dirty laundry piling up? Bring it in to the office. Bring Fido too, so he doesn’t get lonely. There’s a climbing wall, nap pods (lay down in the capsule, set the alarm, zzzzz), a bowling alley, multiple gyms, a variety of healthy cafes, mini kitchens, and classes on anything from American Sign Language to Public Speaking. In a shared, community garden, Googlers plant seeds, knowing that if they get too busy, a landscaper will pull their weeds. “We work hard to create the healthiest, happiest and most productive work environments possible that inspire collaboration and innovation,” said spokeswoman Katelin Todhunter-Gerberg. “When you look at how some of these companies operate, they’re in effect, sweat shops. … They want 80, 90, 100 hours of work. 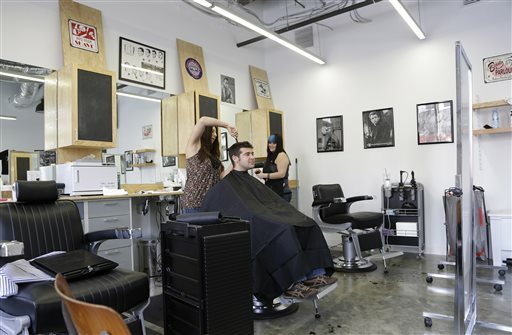 In order to even make that tolerable, of course you have to offer haircuts and food and places to sleep or else people would have to go home,” he said.